Soup, especially puréed, is one of few dishes I can pretty much rely on my toddler to eat. He loves it - almost regardless of what goes in it, as long as it's not too spicy. And as long as he can't see it, I guess. We, his parents, are however not huge soup fans. His dad often complains that it's not filling, and I often find it plain and boring. 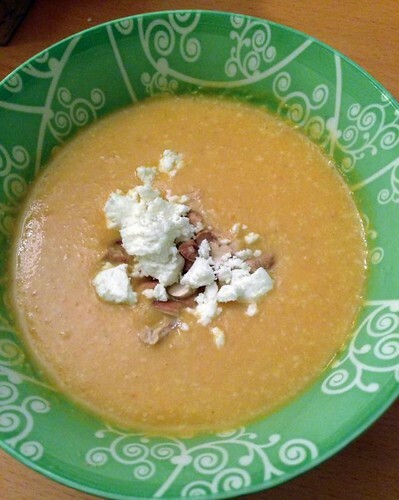 But since Titus loves soup, I keep an eye out for interesting recipes and this one caught my eye at Ann-Louise's Swedish blog: Lilla Matderivén. Carrots are always good, and with the textural addition of cooked cashews and the zippiness of feta cheese... yeah. Good. Very. Fry the shalotts (or onion) in the oil, on medium heat. When it looks transclucent, add carrots, cashews and lentils. After a few minutes, add the vegetable stock. Turn the heat up to high and bring to a boil. Then, cover with a lid, lower the heat and let it simmer on low heat for about 20 minutes. Check to make sure the carrots are soft. Crumble in half of the feta (reserve the other half for serving) and then use an immersion blender to purée the soup until very smooth. Serve with the reserved feta, and some toasted cashews. I'll try your recipe in the near future. It looks delicious!